Among the known patterns of 13 star American flags, there are varying degrees of rarity. The most common pattern is the 3-2-3-2-3 pattern, also known as the Hopkinson pattern after Francis Hopkinson, who served on the committee that proposed the design of the first American flag in the Continental Congress in 1777. That is followed by the 13 star medallion pattern, and the 4-5-4 pattern. I would estimate that among antique American flags in the 13 star count from any era pre-dating 1925, about 70% of them are 3-2-3-2-3, 20% of them are 13 star medallions, 5% are 4-5-4 pattern, and the remaining 5% of known antique examples are some other rarer pattern, such as the Betsy Ross pattern (which is surprisingly scarce), the Cowpens pattern, the Trumbull pattern, or some other unique or nearly unique pattern. There are just two flags that I know of in this very rare 4-4-5 pattern--this flag, and another that surfaced in 2014. The Smithsonian also notes a 4-4-5 example that was examined in 1972, though I have not seen photos of the flag examined at the Smithsonian and I don't know if it the same as one of the two that I know of. This flag is particularly beautiful and in fine condition. It is entirely hand sewn with very large and folky single-appliqué stars. The flag is made of wool bunting with cotton stars and a cotton hoist. Three of the red stripes are pieced together. The quality of the flag is exceptional, and indicative of a manufactured flag made by one of several outfitters and mercantile companies such as Horstmann Brothers or Leighton & Pollard that produced flags in the 1860-1880 period. It is very closely related in style, construction, and age to at least three other flags in the Rare Flags collection: a 13 star example (IAS-00109) made by the company of Leighton & Pollard, circa 1870, a 12 star example (IAS-00316), and a 15 star example (IAS-00317). All four flags are hand sewn, have large single-appliqué stars that dance and fill up the canton, and are made of high quality wool bunting and fine cotton fabric. Though this flag could date as early as the Civil War, it could also date as late as the 1880's. 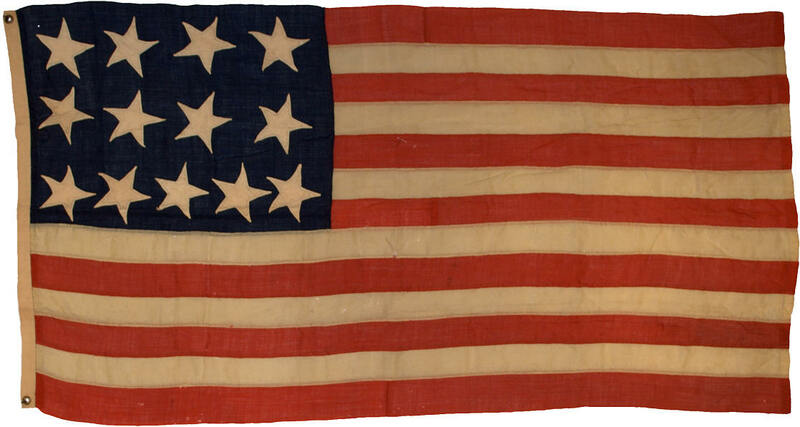 Very few hand sewn single-appliqué flags were made during or after the 1890s. Given the strong similarities between this flag and IAS-00109, which dates clearly to circa 1870 based on the company history of Leighton & Pollard, I'm confident that this flag also dates to the same time period. At just 38" x 70", the flag is beautifully proportioned and considered small for the era, whereas most sewn flags of this period were more than 8 feet in length. It is an extraordinary rarity among antique American flags. Click here to see a gallery of 13 star flags in the Rare Flags collection.